Start smart by shortening your supply chain. Did you know the average delivery distance for ready-mix concrete is just 12km and for precast only 121km? By choosing local construction materials the CO2 associated with transportation is reduced and our UK economy is boosted. Think sustainably from the start. 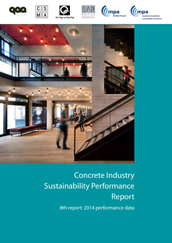 Concrete is a construction industry leader in ethical sourcing. Did you know 90% of concrete is already certified to the BES 6001 responsible sourcing standard? This is higher than any other construction material. In addition to BES 6001, 89.2% of concrete production sites are covered by UKAS certified Environment Management Schemes (EMS) with the target set for 2020 that 95% of production sites have an EMS. The local nature of concrete production, and its well-integrated supply chain, has resulted in industry gaining a high level of accreditation to what is currently the optimum benchmark for responsible sourcing. Designers may now easily source accredited material, and gain the maximum credits currently achievable, in sustainability assessment tools such as BREEAM.